2006-03-02 Application filed by Roamware, Inc. filed Critical Roamware, Inc.
A system for implementing call control services for an inbound roamer is provided. The system includes a control node to implement the call control services in response to an initiation request. The system further includes a service node to send a terminating customized applications for mobile network enhanced logic subscription information (T-CSI) for a called number in response to a routing request for the called number. The T-CSI contains an address pointing to the control node. The system further includes a switching center to send the routing request for the called number. The called number is present in a call received from the inbound roamer. [000I]TNs application claims priority from United States Provisional Patent Application Serial No. 60/658,258 entitled Dynamic CAMEL approach for Implementing Call Control Services for Inbound Roamers, filed March 02, 2005, the entirety of which is incorporated herein by reference. Mobile communication systems are used worldwide. Hence, various operators offer international roaming to their users. An operator is specifically interested in inbound roaming revenues where users from a foreign operator visit the operator's network. To increase inbound roaming revenue, many operators offer various value added call control services to the inbound roamers. TECH/403322.2 1 User Part (ISUP) based node. In an example of this technique, a voice trunk equipped with service node is used. In another example, an ISUP loop-back at originating Mobile Switching Centre (MSC) is used to route an inbound roamer's calls through the service node, optimally applying various call service logics. In both the cases, circuit resources are heavily utilized, and switches may not be able to provide finer control of dialing digits analysis. Further, the ISUP signaling does not have International Mobile Subscriber Identity (IMSI) of the calling inbound roamer, hence the service node is unable to generate the Call Detail Records (CDR) for that inbound roamer. The IMSI can be found from a Home Public Mobile Network's (HPMN) Home Location Register (HLR) by using Mobile Application Part (MAP) signaling on Mobile Subscriber ISDN (MSISDN) of the calling inbound roamer. In another technique, Mobile Application Part Send Routing Information (MAP SRI) signaling is used to implement one or more of the call control services. In this case, a switch may be configured to issue MAP SRI on certain selected numbers for inbound roamers. When the MAP SRI signaling reaches the service node, the service node applies various application logics and returns a number back to the switch. The MAP signaling approach does not have equivalent resource utilization as the ISUP signaling. However, it is limited by the application logic and billing as it does not present the calling party number or IMSI of the inbound roamer or duration of the call. In another technique, MAP SRI signaling is combined with ISUP signaling. For example, the switch first sends MAP SRI signaling on the called number to the service node. The service node then checks the called number to determine whether the application logic is applicable. If it is not, the service node will return the original number. However, if applicable, the service node returns a prefixed called number so the switch can subsequently route the call to the service node via the ISUP signaling. This hybrid approach reduces ISUP signaling resource utilization. However, it is disadvantageous, since the MAP SRI signaling does not have the calling party, and ISUP party does not have the IMSI of the calling party. TECH/403322.2 2 to initiate IN messages on the called number to the service node. Thereafter, the service node applies various application logics to interact with the switch. While, the IN approach does not heavily utilize the circuit resources and can generate billing for the call control services, it is switch dependent. Some switches might present the IMSI of the calling party. Some switches support certain IN functions allowing billing to be generated at the switch. This eliminates the need to generate billing at the service node. However, the IN approach is disadvantageous because the operators often have not paid license of the switch dependent IN specification for deploying the IN applications other than those from the switch vendor. Thus there is a need for an alternative standard based approach that is cost-effective and utilizes minimum circuit resources. Further, it is desirable that the service node operates in a switch independent environment, perform various kinds of application logics and interact with the switch using MSISDN of the calling party without requiring the IMSI of the inbound roamer. [001O]FIG. 1 represents a flowchart for a method for implementing call control services for an inbound roamer, in accordance with an embodiment of the invention. [001I]FIG. 2 represents a system for implementing call control services for an inbound roamer, in accordance with an embodiment of the invention. FIG. 3 represents a call flow for implementing short-code translation for an inbound roamer, in accordance with an embodiment of the invention. FIG. 4 represents a call flow for implementing misdialed digits correction for an inbound roamer, in accordance with an embodiment of the invention. FIG. 5 represents a call flow for implementing optimum routing for an inbound roamer, in accordance with an embodiment of the invention. TECH/403322.2 3 FIG. 6 represents a call flow for implementing missed call alert for an inbound roamer, in accordance with an embodiment of the invention. FIG. 7 represents a call flow for implementing caller line identification for an inbound roamer, in accordance with an embodiment of the invention. A method for implementing call control services for an inbound roamer is provided. The method includes receiving a routing request for a called number at a service node. The called number is present in a call from the inbound roamer. The method further includes sending a Terminating Customized Applications for Mobile network Enhanced Logic Subscription Information (T-CSI) for the called number by the service node to a switching center. The T-CSI contains an address pointing to a control node. Further, the method includes passing control of the call to the control node to implement the call control services for the inbound roamer. A system for implementing call control services for an inbound roamer is also provided. The system includes a control node to implement the call control services in response to an initiation request. The system further includes a service node for sending a Terminating Customized Applications for Mobile network Enhanced Logic Subscription Information (T-CSI) for a called number in response to a routing request for the called number. The T- CSI contains an address pointing to the control node. The routing request for the called number and the initiation request are sent by a switching center, which receives a call from the inbound roamer. TECH/403322.2 4 convenience only and do not affect the scope or meaning of the claimed invention. [002O]FIG. 1 represents a flowchart for a method for implementing call control services for an inbound roamer, in accordance with an embodiment of the invention. At step 102, a service node receives a routing request for a called number. Prior to sending the routing request, a switching center receives a call from the inbound roamer for the called number. Thereafter, in accordance with one embodiment of the invention, the switching center is configured to send the routing request to the service node when the called number satisfies pre-determined criteria. In one embodiment of the invention, the routing request is a Send Routing Information (SRI) message for the called number sent by the switching center. In one embodiment of the invention, the switching center is a Global System for Mobile communication (GSM) Service Switching Function (SSF) node. The routing request sent is concurring to Mobile Application Part (MAP) protocol. TECH/403322.2 5 a Basic Call State Model (BCSM) is detected. The DP can be configured in order to notify the control node (or the GSM SCF) that the DP was encountered, and potentially to allow the control node to influence subsequent handling (or control) of the call. The switching center (or the GSM SSF) generates the IDP when a trigger is detected at the DP in the BCSM, to request instructions from the control node (or the GSM SCF). Along with the IDP the control node also receives the inbound roamer's number, the called number and an IMSI associated with the called number. In one embodiment of the invention, the service node sends the IMSI associated with the called number to the switching center (or the GSM SSF). The IMSI sent by the service node is a dummy IMSI for the called number and is sent only to comply with the standard protocol in use. The protocol used is a CAMEL protocol. In one embodiment of the invention, one or more parameters are extracted from the IDP by the control node. For example, the parameters may be the service key, the called number, the inbound roamer's number, inbound roamer's category, location number, and address of GMSC / the switching center. In one embodiment of the invention, a tracking node monitors transactions of the inbound roamer between VPLMN and HPLMN to create a roamer database for the inbound roamer. The transactions are concurring to MAP protocol and occur across international roaming borders. 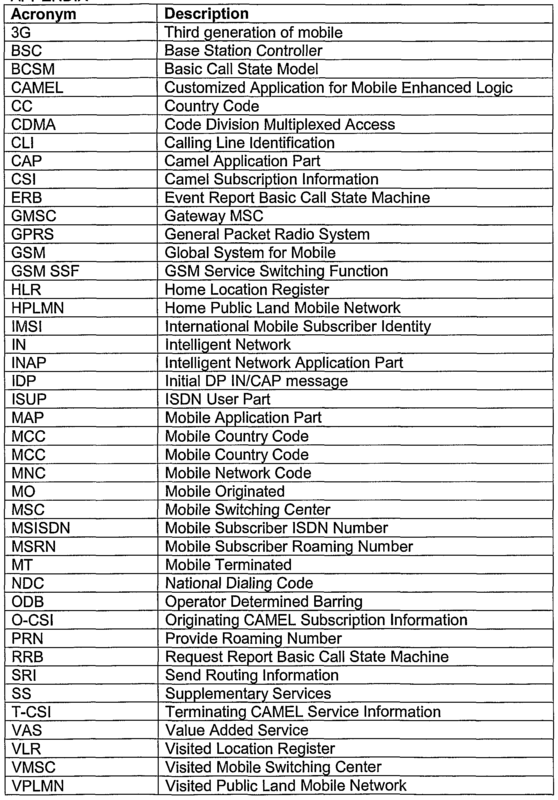 The roamer database contains fields such as Mobile Subscriber ISDN Number (MSISDN), IMSI, Originating CAMEL Subscription Information (O-CSI), Call Forwarding Info, Call Barring Info, Operator Determined Barring (ODB), Supplementary Services (SS), Visited Mobile Switching Center (VMSC) and a Visiting Location Register (VLR) for the inbound roamer. The control node uses the fields from the roamer database together with the parameters extracted from the IDP to apply different logics and procedures in the applications to be used by the inbound roamer. TECH/403322.2 6 inbound roamer for a called number. For example, switching center 202 receives a call from an inbound roamer number (A) dialing a called number (B). In one embodiment of the invention, switching center 202 is a Gateway Mobile Switching Center (GMSC). In another embodiment of the invention, switching center 202 is a Mobile Switching Center (MSC) of VPLMN. In yet another embodiment of the invention, switching center 202 is the GSM SSF. Switching center 202 is configured to send a routing request for the called number (B) to service node 204. This ensures that the call from the inbound roamer is not passed onto the HPLMN of the inbound roamer and the call routing is handled from the VPLMN itself. In one embodiment of the invention, the routing request is sent using a MAP SRI for the called number B. Service node 204, after receiving the routing request, sends a T-CSI for the called number (B) to switching center 202. In one embodiment of the invention, service node 204 is the VPMN VAS node and serves as the virtual HLR of the called number (B). The T-CSI includes a service key which identifies an application, control node 206 uses for the inbound roamer. Further, the T-CSI also contains an address pointing to either service node 204 or to control node 206. In an embodiment of the invention, control node 206 is a GSM SCF and may be integrated with service node 204. TECH/403322.2 7 SS service, VMSC/VLR for the inbound roamer A. In yet another embodiment of the invention, control node 206 uses the IMSI for the inbound roamer A to generate billing information for the call made from A to B. Further, the fields from the roamer database 210, together with the parameters extracted from the IDP, are used by control node 206 to apply different logics and procedures for various applications for the inbound roamer. In one embodiment of the invention, the applications are value added services used by the inbound roamer A. FIG. 3 represents a call flow for implementing short-code translation for an inbound roamer, in accordance with an embodiment of the invention. At step 302, switching center 202 receives a call from the inbound roamer (A) dialing the called number (B). Switching center 202 checks the called number for pre-determined criteria. The pre-determined criteria are specific for the type of application used by the inbound roamer. For example, in this case, when the inbound roamer uses the short-code translation as the value added service, the pre-determined criteria includes checking whether length of the dialed digits is less or equal to a pre-defined value. Further, a check is also performed on whether the prefix of the called number is not a local number prefix and is not an international number. Once all the criteria are satisfied, at step 304, switching center 202 sends a SRI for B to service node 204. At step 306, service node 204 sends a T-CSI and an IMSI associated with the called number (B) to switching center 202. The T-CSI includes the service key and the address of control node 206. TECH/403322.2 8 that there exists a long-code translation in a short-code translation table for the MCC of the inbound roamer. However, if the called number is not a short- code, then control node 206 issues the Continue message to switching center 202 for normal routing of the call. In case the dialed number is a short-code, then at step 310, control node 206 issues a translated long-number corresponding to the short-code. In some cases, the long-number is a local number. Further, if the inbound roamer requires billing, control node 206 issues a Request Report Basic Call State Machine (RRB) to switching center 202 on notification mode on tAnswer and then tDisconnect event before issuing the long-number. Switching center 202 thereafter sends an Event Report Basic Call State Machine (ERB) to report on the tAnswer and the tDisconnect to control node 206, which are then used for generating billing information. TECH/403322.2 10 international number does not satisfy the conditions of optimal routing, control node 206 issues the Continue message to switching center 202 for normal routing of the call. Otherwise, at step 510, control node 206 issues a mobile application part provide roaming number (MAP PRN) to the inbound roamer VLR, which in turn returns the mobile station roaming number (MSRN) to control node 206. Further, if the inbound roamer requires billing, control node 206 issues the RRB to switching center 202 on notification mode on tAnswer and then tDisconnect event before issuing the MSRN. Switching center 202 thereafter sends an Event Report Basic Call State Machine (ERB) to report on the tAnswer and the tDisconnect to control node 206, which are then used for generating billing information. TECH/403322.2 11 send a missed call alert to the called number and/or to the calling inbound roamer when the called number is available again. FIG. 7 represents a call flow for implementing caller line identification for an inbound roamer, in accordance with an embodiment of the invention. At step 702, switching center 202 receives a call from an inbound roamer A calling for a called number B. Switching center 202 checks the called number for pre-determined criteria. This includes checking whether the called number is international number. Further, switching center 202 checks whether the prefix of the called number belongs to belong to some CC NDC list and the dialed digits are an international number. At step 704, switching center 202 sends a SRI for B to service node 204. At step 706, service node 204 sends a T-CSI and an IMSI associated with the called number to switching center 202. The T-CSI includes the service key and the address of control node 206. At step 708, switching center 202 sends the IDP along with A, B and IMSI (B) to control node 206. Control node 206 checks whether the MCC/MNC of the inbound roamer is blacklisted. If the inbound roamer is blacklisted, control node 206 sends a Continue message to switching center 202 for normal routing of the call. If the inbound roamer is not blacklisted, control node 206 applies a CLI algorithm to obtain a routing number. Thereafter, control node 206 at step 710, issues a routing number to switching center 202. Further, if the inbound roamer requires billing, control node 206 issues the RRB to switching center 202 on notification mode on tAnswer and then tDisconnect event before issuing the routing number. Switching center 202 thereafter sends the tAnswer and the tDisconnect, which are then used for billing. TECH/403322.2 12 a control node. The computer usable medium further includes computer usable program code for passing control of the call to the control node to implement the call control services for the inbound roamer. The components of Inbound Roaming Call Control System (IRCCS) described above include any combination of computing components and devices operating together. The components of the IRCCS can also be components or subsystems within a larger computer system or network. The IRCCS components can also be coupled with any number of other components (not shown), for example other buses, controllers, memory devices, and data input/output devices, in any number of combinations. In addition any number or combination of other processor based components may be carrying out the functions of the IRCCS. It should be noted that the various components disclosed herein may be described using computer aided design tools and/or expressed (or represented), as data and/or instructions embodied in various computer- readable media, in terms of their behavioral, register transfer, logic component, transistor, layout geometries, and/or other characteristics. Computer-readable media in which such formatted data and/or instructions may be embodied include, but are not limited to, non-volatile storage media in various forms (e.g., optical, magnetic or semiconductor storage media) and carrier waves that may be used to transfer such formatted data and/or instructions through wireless, optical, or wired signaling media or any combination thereof. TECH/403322.2 13 interpretations of the word: any of the items in the list, all of the items in the list and any combination of the items in the list. The above description of illustrated embodiments of the IRCCS is not intended to be exhaustive or to limit the IRCCS to the precise form disclosed. While specific embodiments of, and examples for, the IRCCS are described herein for illustrative purposes, various equivalent modifications are possible within the scope of the IRCCS, as those skilled in the art will recognize. The teachings of the IRCCS provided herein can be applied to other processing systems and methods. They may not be limited to the systems and methods described above. TECH/403322.2 14 roamer in a manner that is agnostic to the capabilities of the visited or non- accustomed network can be of use and provided through any type of telecommunications medium, including without limitation: (i) any mobile telephony network including without limitation GSM, 3GSM, 3G, CDMA, WCDMA or GPRS, satellite phones or other mobile telephone networks or systems; (ii) any so-called WiFi apparatus normally used in a home or subscribed network, but also configured for use on a visited or non-home or non-accustomed network, including apparatus not dedicated to telecommunications such as personal computers, Palm-type or Windows Mobile devices,; (iii) an entertainment console platform such as Sony Playstation, PSP or other apparatus that are capable of sending and receiving telecommunications over home or non-home networks, or even (iv) fixed-line devices made for receiving communications, but capable of deployment in numerous locations while preserving a persistent subscriber id such as the eye2eye devices from Dlink; or telecommunications equipment meant for voice over IP communications such as those provided by Vonage or Packetδ. In describing certain embodiments of the IRCCS under the present invention, this specification follows the path of a telecommunications call from a calling party to a called party. For the avoidance of doubt, that call can be for a normal voice call, in which the subscriber telecommunications equipment is also capable of visual, audiovisual or motion-picture display. Alternatively, those devices or calls can be for text, video, pictures or other communicated data. ITU-T Recommendation Q.1214 (1995), Distributed functional plane for intelligent network CS-1. ITU-T Recommendation Q.1218 (1995), Interface Recommendation for intelligent network CS-1. ITU-T Recommendation Q.730 (1999), ISDN user part supplementary services. ITU-T Recommendation Q.762 (1999), Signaling system No. 7 - ISDN user part general functions of messages and signals. ITU-T Recommendation Q.763 (1999), Signaling system No. 7 - ISDN user part formats and codes. ITU-T Recommendation Q.764 (1999), Signaling system No. 7 - ISDN user part signaling procedures. ITU-T Recommendation Q.766 (1993), Performance objectives in the integrated services digital network application. ITU-T Recommendation Q.765 (1998), Signaling system No. 7 - Application transport mechanism. ITU-T Recommendation Q.769.1 (1999), Signaling system No. 7 - ISDN user part enhancements for the support of Number Portability. 1. A system for implementing call control services for an inbound roamer, the system comprising: a control node to implement the call control services in response to an initiation request; a service node to send a terminating customized applications for mobile network enhanced logic subscription information (T-CSI) for a called number in response to a routing request for the called number, wherein the T-CSI contains an address pointing to the control node; and a switching center to send the routing request for the called number and the initiation request, wherein the called number is present in a call received from the inbound roamer and the called number satisfies pre-determined criteria. 2. The system of claim 1, wherein the switching center is one of a gateway mobile switching center (GMSC) and a mobile switching center (MSC) configured to send the routing request for the called number to the service node. 3. The system of claim 1, wherein the switching center is a global system for mobile communication service switching function (GSM SSF) configured to send the routing request for the called number to the service node. 4. The system of claim 1, wherein the service node sends an International Mobile Subscriber Identity (IMSI) associated with the called number to the switching center. 5. The system of claim 1, wherein the service node is a visited public land mobile network (VPLMN) value added service (VAS) node. 6. The system of claim 1, wherein the control node is a global system for mobile communication service control function (GSM SCF) for implementing the call control services for the inbound roamer. TECH/403322.2 19 with the service node for implementing the call control services for the inbound roamer. 8. The system of claim 1 , wherein the T-CSI comprises a service key identifying an application to be used by the control node. 9. The system of claim 1, wherein the initiation request contains an initial detection point (IDP). 10. The system of claim 1 further comprises a tracking unit for creating a roamer database for the inbound roamer by monitoring transactions of the inbound roamer between a visited public land mobile network visited location register (VPLMN VLR) and a home public land mobile network home location register (HPLMN HLR), wherein the transactions are concurring to a mobile application part (MAP) protocol. 11. The system of claim 10, wherein the tracking unit creates the roamer database including one or more fields for the inbound roamer selected from a group comprising a Mobile Station International Subscriber Directory Number (MSISDN), an inbound roamer international mobile subscriber identity (IMSI), an Originating Customized Applications for Mobile Network Enhanced Logic Subscription Information (O-CSI) for the inbound roamer, Call forwarding information, a Visiting Mobile Switching Centre (VMSC), Operator Determined Barring (ODB), Supplementary Services (SS), visited mobile switching center (VMSC) and a Visiting Location Register (VLR). 12. The system of claim 11, wherein the control node uses the inbound roamer IMSI to generate billing information for the call. TECH/403322.2 20 computer usable program code for sending a terminating customized applications for mobile network enhanced logic subscription information (T-CSI) for the called number by the service node to a switching center, wherein the T-CSI contains an address pointing to a control node; and computer usable program code for passing control of the call to the control node to implement the call control services for the inbound roamer. 14. The computer program product of claim 13 further comprises computer usable program code for sending an International Mobile Subscriber Identity (IMSI) associated with the called number, wherein the IMSI is sent by the service node. 15. The computer program product of claim 13 further comprises computer usable program code for configuring the switching center to send the routing request for the called number to the service node when the called number satisfies the pre-determined criteria. 16. The computer program product of claim 13, wherein the call is received at the switching center, wherein the switching center is a Global System for Mobile communication Service Switching Function (GSM SSF) node. 17. The computer program product of claim 13 further comprises computer usable program code for using a service key included in the T-CSI to identify an application to be used by the control node. 18. The computer program product of claim 13, wherein passing the control of the call to the control node comprises sending an IDP for implementing the call control services for the inbound roamer by the switching center. TECH/403322.2 21 (HPLMN HLR), wherein the transactions are concurring to a mobile application part (MAP) protocol. 20. The computer program product of claim 19, wherein the control node uses the roamer database to generate billing information for the call. 21. A method for implementing call control services for an inbound roamer, the method comprising: receiving a routing request for a called number at a service node, wherein the called number is present in a call from the inbound roamer and the called number satisfies pre-determined criteria; sending a terminating customized applications for mobile network enhanced logic subscription information (T-CSI) for the called number by the service node to a switching center, wherein the T-CSI contains an address pointing to a control node; and passing control of the call to the control node to implement the call control services for the inbound roamer. 22. The method of claim 21 further comprises sending an International Mobile Subscriber Identity (IMSI) associated with the called number to the switching center, wherein the IMSI is sent by the service node. 23. The method of claim 21 further comprises configuring the switching center to send the routing request for the called number to the service node when the called number satisfies the pre-determined criteria. 24. The method of claim 21 , wherein the call is received at the switching center, wherein the switching center is a Global System for Mobile communication Service Switching Function (GSM SSF) node. 25. The method of claim 21 further comprises using a service key included in the T-CSI to identify an application to be used by the control node. 26. The method of claim 21 , wherein passing control of the call to the control node comprises sending an IDP for implementing the call control services for the inbound roamer by the switching center. TECH/403322.2 22 location register (HPLMN HLR), wherein the transactions are concurring to a mobile application part (MAP) protocol. 28. The method of claim 27, wherein the control node uses the roamer database to generate billing information for the call. 29. The method of claim 21 further comprises issuing a long number translation when the called number from the inbound roamer is a short- code, wherein the issuing is performed by the control node. 30. The method of claim 21 further comprises issuing a corrected number translation when the called number from the inbound roamer is an invalid number, wherein the issuing is performed by the control node. 31. The method of claim 21 further comprises issuing a Mobile Subscriber Roaming Number (MSRN) to the switching center for optimally routing the call from the inbound roamer, wherein the issuing is performed by the control node. 32. The method of claim 21 further comprises issuing a Request Basic Call State Model (RRB) to the switching center when a tBusy, a tNoAnswer, a tAnswer and a tDisconnected occur as events, wherein the issuing is performed by the control node. 33. The method of claim 21 further comprises issuing a routing number to the switching center, wherein the issuing is performed by the control node. ES2359736T3 (en) 2011-05-26 csi dynamic generation of outbound roamers.